More than one in eleven American households rent self-storage space, according to the Self Storage Association, often the result of being in transition between residences. Vines Storage, a leading indoor and outdoor self-storage facility in Redlands can provide you with convenience and the assurance of knowing your personal possessions are safely waiting for you when you are finally relocated. 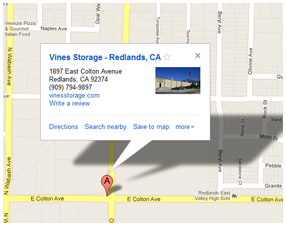 Located off East Colton Avenue, Vines Storage affords you the best amenities for short or long-term storage. Our climate-controlled units can be leased in a variety of sizes, from 5' x 5' spaces to spacious 20' x 20' units with sufficient capacity to contain the contents of your entire household. Storing your belongings in climate controlled self-storage means that you do not have to worry about mold, excess moisture, or the fluctuations in temperature that can potentially damage your items. The added security at Vines Storage gives you 24-hour surveillance with a 32-camera state of the art monitoring system, plus gated entry with secure keypad access. Disassemble tables, beds, and other large pieces of furniture. Store sofas and mattresses upright, placing them on protective plastic sheets or blankets. Repurpose dressers by storing clothing in drawers rather than keeping them empty, and stack boxes on top of dressers to make use of vertical space. Keep the heaviest boxes on the bottom of a stacked box pile. Organize the self-storage unit to have an open center aisle for easy access. When packing ceramic dishware, glasses, mirrors, lamps, or figurines, wrap the items first in bubble wrap, foam sheets, or brown paper to cushion before packing into boxes. Fill open spaces in boxes with packing peanuts or additional bubble wrap for added security against breakage. This also keeps insects and dust at bay. Don't stack half-full boxes, which may buckle and damage fragile contents. Avoid wrapping items in newspaper that could potentially become stained from transferred ink. Use plywood to support several stacked boxes. Place horizontal sheets between boxes to relieve pressure. This will optimize use of vertical open space and can actually double the capacity of your unit.